The 2014 Chevrolet Silverado is a full-size pickup truck that comes with improved interior and a lineup of new and more fuel-efficient engines. Also changed is the steering assist, that now is electric. 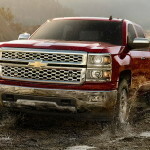 The all-new 2014 Chevy Silverado comes with a roomies cabin with new design and also with more luxury and safety features than the previous model. This massive truck competes on the market with Ford F-150, RAM 1500 and Toyota Tundra. The new 2014 Chevrolet Silverado 1500 is offered in a variety of cab/cargo-bed configurations in both two- and four-wheel drive. Body styles include Regular cab with standard (6-foot, 6-inch) bed or long (8-foot) bed, Extended (Double) cab with standard bed and Crew cab with standard or short (5-foot, 8-inch) bed. The Regular cab comes in Work Truck (WT) and LT trims, while the Extended and Crew cabs come in LT, LTZ, High Country and off-road-oriented Z71 trims. The base Work Truck (WT) comes standard with 17-inch steel wheels, a 40/20/40 bench front seat, cruise control, keyless entry, chrome bumpers, heated power mirrors, air-conditioning, a tilt steering wheeel, a 4-speaker sound system with USB inputs, Bluetooth connectivity and 4-inch color display. The LT adds 17-inch aluminum wheels, a 40/20/40 front seat with locking storage underneath, a leather-wrapped steering wheel with audio controls, a chrome grille insert and a 6-speaker audio system. The 2014 Chevrolet Tahoe is a large, full-size SUV that seats up to nine and it is available with rear- or four-wheel drive. The 2014 Chevrolet Tahoe shares its platform with other large SUV from GM, like GMC Yukon and the luxurious Cadillac Escalade, and also it is a shorter version of the Chevrolet Suburban. The 2014 Tahoe competes with Ford Expedition, Nissan Armada and Toyota Sequoia. 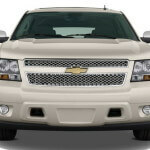 The 2014 Chevrolet Tahoe is not a good choice for those who like luxury. This SUV is dedicated to those who are looking a truck-like car with good passenger space and good towing capacity, and that also can be suitable for everyday family use. With 8,500 lbs of maximum towing capability and with 108.9 cu. ft. of maximum cargo space, the Tahoe is able to satisfy the needs of the family in daily displacements or in trips that require a lot of equipment. The 2014 Chevrolet Tahoe is offered in three trim levels: LS, LT and LTZ. The LS comes standard with 17-inch alloy wheels, 6-way power front seats, tri-zone manual climate control, a 60/40-split second-row seat, a 50/50-split removable third row seat, power-adjustable pedals, remote ignition, rear parking sensors, rearview camera, Bluetooth connectivity and a 6-speaker sound system with a CD player and an iPod/USB interface. The LT model adds tri-zone automatic climate control, foglights, driver memory functions, leather upholstery and a 9-speaker Bose audio system. The Z71 Off-Road package is available for the LT and adds 18-inch alloy wheels with all-terrain tires, skid places and unique front fascia. Power-folding mirrors, a power rear liftgate and heated front seats are all available as options. The 2014 Chevrolet SS sedan is an all-new model and also is the first rear-wheel-drive sedan offered by Chevrolet in 17 years. This sports sedan competes with Ford Taurus SHO, Chrysler 300C SRT8, Hyundai Genesis and Dodge Charger SRT8. The new SS shares its platform (named Zeta) with the Australian-built rear-drive Holden Commodore and it is a refined and more aggressively version of the Chevrolet Caprice PPV (Police Pursuit Vehicle) that is sold for police fleets. This muscle-car is powered by a 415-horsepower, 6.2-liter V8 engine (same engine from the Camaro) that generates 384 pound-feet of torque. This engine is paired with a 6-speed automatic transmission with shift paddles mounted behind the steering wheel. 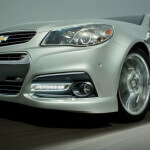 Chevrolet estimates the SS sedan accelerates from zero to 60 mph in five seconds. The all-new 2014 Chevrolet SS sedan comes standard with a performance-tuned electric power steering, Brembo brakes, 19-inch five-spoke aluminum wheels, aluminum hood and rear trunk lid, foglights, LED running lamps, high-intensity discharge headlights, leather upholstery, blue ambient lighting, eight-way adjustable front seats, a 4.2-inch touchscreen multimedia system, a navigation system, the Chevrolet’s MyLink Infotainment System, Bluetooth connectivity and a 9-speaker Bose sound system. The 10-th-generation of Impala is Chevy’s all-new flagship sedan. The 2014 Chevrolet Impala is a five-passenger full-size sedan that is bigger, quieter and more efficient than before and shares GM’s Epsilon platform with the Chevrolet Malibu, Cadillac XTS and Buick Regal. The new 2014 Chevrolet Impala is a modern car with a spacious cabin, refined interior, comfortable ride, a lot of convenience features and plenty of rear-seat room. 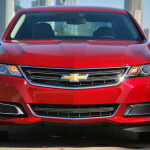 The 2014 Impala competes on the market with Toyota Avalon, Hyundai Azera, Ford Taurus and Chrysler 300. The 2014 Chevrolet Impala is offered in LS, LT and LTZ trim levels. The LT and LTZ are subdivided into 1LT, 2LT, 1LTZ and 2LTZ packages, depending on engines that are equipped. The entry-level LS comes standard with 18-inch steel wheel, keyless entry, automatic headlights, air-conditioning, cruise control, full power accesories, a trip computer, an eight-way power adjustable driver seat, Bluetooth connectivity and a 6-speaker sound system with a 4.2-inch color display and iPod/USB interface. The LT adds 18-inch alloy wheels, dual zone automate climate control, cloth upholstery with vinyl trim, heated side mirrors, a leather-wrapped steering wheel and the MyLink infotainment system with an 8-inch touchscreen display. The Convenience package adds parking sensors, a rearview camera and remote start. The Premium Seating package adds simulated suede upholstery and seat heaters. The Navigation package includes keyless ignition, keyless entry and a navigation system. The 2013 Chevrolet Camaro is a rear-wheel-drive performance car that is offered in coupe and convertible body styles. Inspired by the Chevrolet’s retro muscle cars, the 2013 Camaro is offered in six trim levels, including the ultra-performance ZL1. The new 2013 Chevrolet Camaro ZL1 competes on the market with Dodge Challenger and Ford Mustang. The new 2013 generation of Chevrolet Camaro captures the look of the original ’67, but it is bigger in any dimension: longer, wider and taller. The cabin of the Camaro is now oriented more around style than function. The standard cloth bucket seats are good. An excellent leather upholstery is available. For the ZL1, the interior is only available in black, with ZL1 logos on the head restraints. The 2013 Chevrolet Camaro ZL1 comes standard with 20-inch alloy wheels, a sport-tuned suspension, a leather-wrapped steering wheel, heated mirrors, auto-dimming rearview and driver’s outside mirrors, heated front seats, massive Brembo brakes, four-mode stability/traction control, active Magnetic Ride Control suspension dampers, a retuned power steering, unique front and rear fascia, a functional carbon-fiber air extractor for the hood, microfiber suedelike upholstery, a flat-bottomed steering wheel and a 9-speaker Boston Acoustics sound system. The ultra-high-performance 2013 Chevrolet Camaro ZL1 uses a supercharged 6.2-liter V8 engine that produces 580 hp and 556 lb-ft of torque. A six-speed manual transmission is standard while a 6-speed automatic is optional. 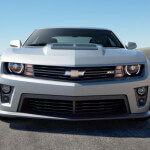 The 2013 Camaro ZL1 accelerates from zero to 60 mph in 4 seconds and has a top speed of 184 mph.